Year 2, Week 23: My Little Pony Pinkie Pie. This is my first character lunch of 2014. To say my family has had to adjust since the new baby has come would be an understatement. If you have been following my blog, you know that I have posted some new reviews and even some longer parenting posts, but this week I am returning to my roots. 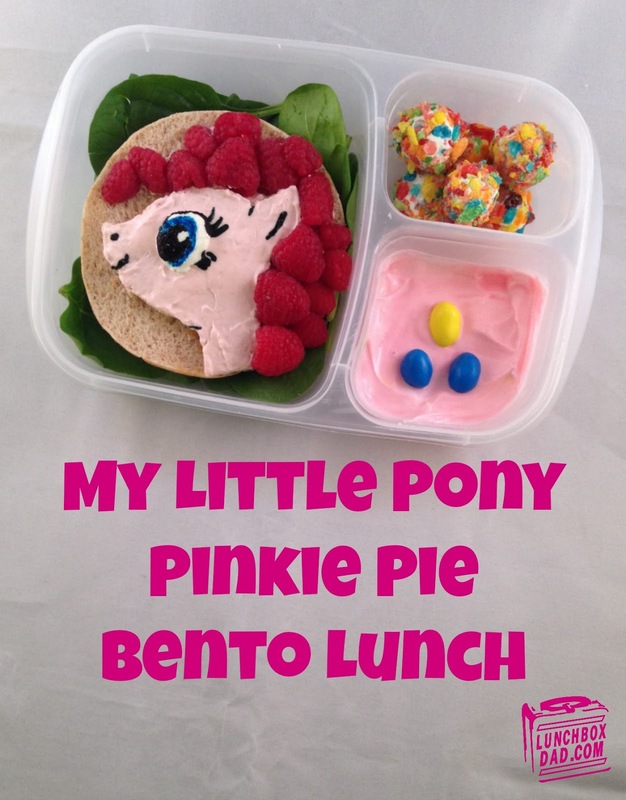 I love doing character lunches for my daughter and creating Pinkie Pie has been a goal ever since I did my Rainbow Dash mashup at the beginning of the year. I hope my daughter loves it, because it was fun to make for her! This lunch also contains some great products from Redwood Hill Farm and Green Valley Organics. The colorful snacks you see above the yogurt are from Redwood Hill Farm and are called "Perpetual Goat Stoppers." They won "The Perfect Bite" award at the first West Coast Cheesemonger Invitational this year. My kids absolutely love them, and so do I! See the story behind them and the recipe HERE. This lunch was made in an Easy Lunch Boxes container. Remember not to miss any news, fun pictures, recipes, or stories by following me on my social media sites. 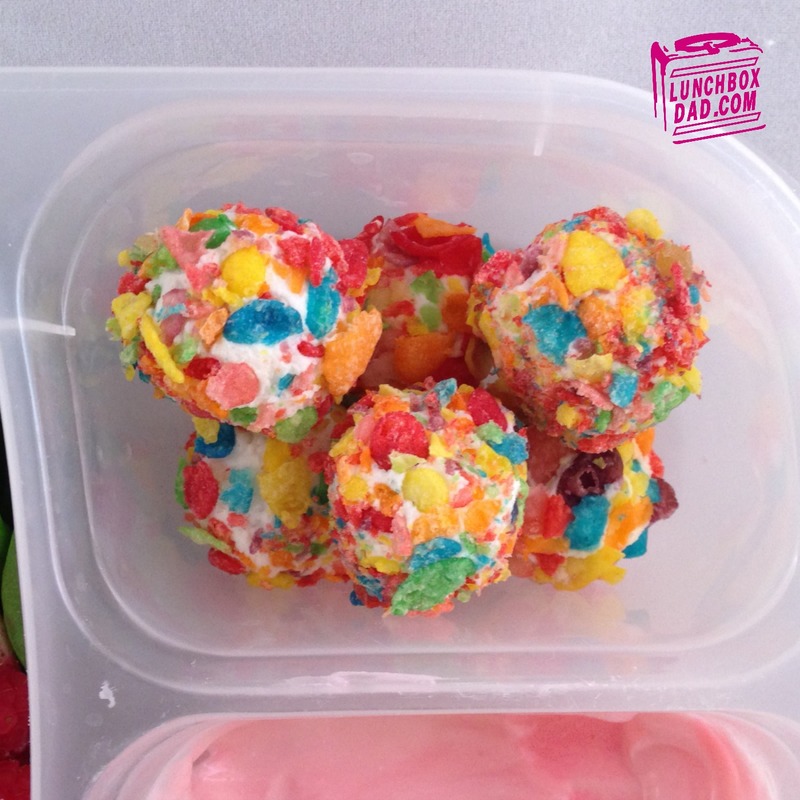 You will want to check out Lunchbox Dad on Twitter, Facebook, Pinterest, and more. 6 Redwood Hill Farms "Perpetual Goat Stoppers"
1. 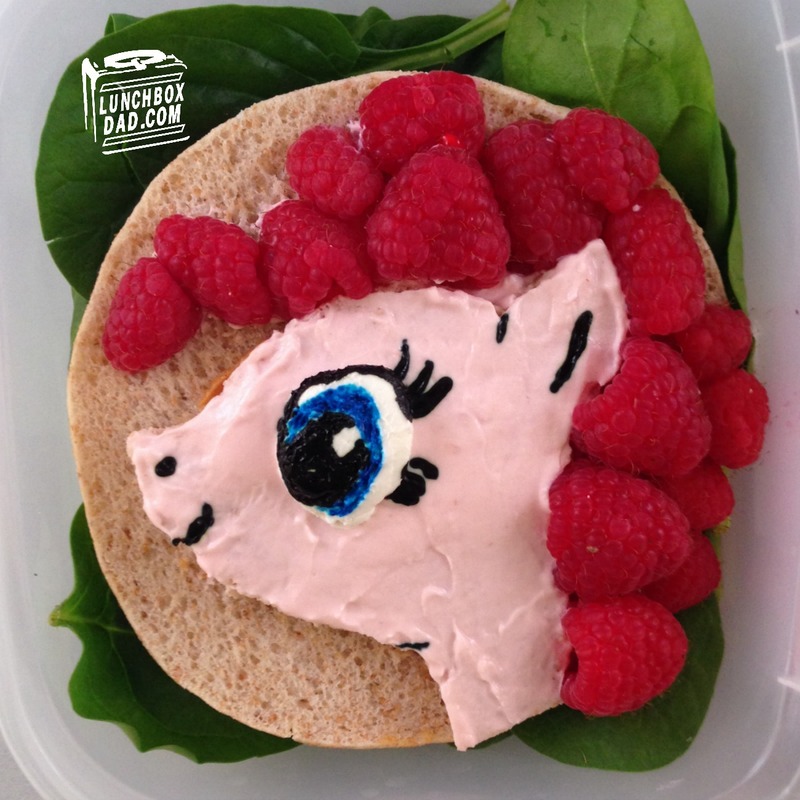 Cut thin sandwich round in the shape of Pinkie Pie's head. It is actually a fairly easy shape. Cover whole piece with strawberry cream cheese. 2. Use a ball of fat-free white cream cheese and flatten into a circle. Place on top of head. Use a toothpick to paint the facial features as shown. 3. Place head on top of second sandwich round and fix in place with a little peanut butter. Make it a sandwich by spreading peanut butter on on third round and press the whole thing together. 4. Attach raspberries around head for Pinkie Pie's hair. I used a little strawberry cream cheese to do this. Place whole sandwich on top of spinach background. 5. Use recipe to make Redwood Hill Farms "Perpetual Goat Stoppers." Place in side dish. 6. Tint your yogurt pink with food coloring. It only takes a drop or two. Place in side dish and top with two blue and one yellow M&Ms. A little tip is to put these in the yogurt as close as possible to when your child will eat the lunch because the color will bleed some. This is Pinkie Pie's cutie mark. Well, it's close. If you want to somehow make balloons, feel free! Disclosure: Redwood Hill Farm sent me their products to review. I have received no other compensation for this post and the opinions I’m expressing here are solely my own. This is so adorably epic! This lunch is so beautiful, I bet your daughter loved it! My husband and I agree: you are the best dad ever!! Oh thanks so much! I am really just an everyday dad though trying to love his kids! Either way, we think you're great! Also, Pinkie Pie is the best pony ever! :) PS I'm nearly 30 and I love My Little Pony. Haha! Thanks so much and thanks for reading. Some other dad bloggers and I are going by the term "Drony" meaning dads who are mlp fans. A Heart Dog and A Cutie for Valentine's Day! New Throwback Thursday Lunch and Linkup!